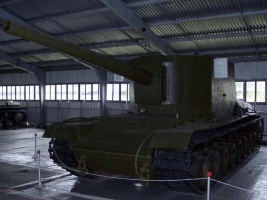 Developed on the basis of the T-100 heavy tank. The vehicle was intended to neutralize enemy pillboxes and destroy enemy vehicles. The only prototype was manufactured in March 1940. The vehicle never entered mass production. The SU-100Y is a very large tank for its tier, larger than even some tier VIII heavy tanks. 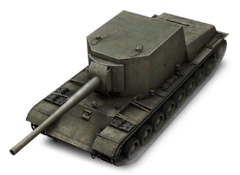 The SU-100Y has a devastating 130mm gun that, with a Gun Rammer and 100% crew, loads in less than 14 seconds, dealing an average of 440 damage a shell. It is also very mobile for its size, but unfortunately has no next to no armor to cover its massive profile. 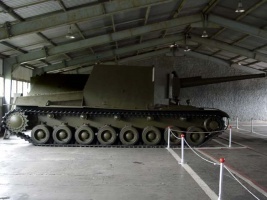 The SU-100Y is sometimes referred to as the "boxtank". 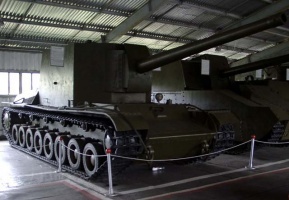 Favored target, due to fearsome gun combined with huge size and low armor. Having constant cover is crucial. One of the best tactics to use in this tank is to play it as a front line support role TD, having a hill to shoot off of, and a rock or house to duck behind after you fire your gun. This tank is never going to do well as a brawler or sniper, and trying to take the role of the VK 36.01 (H) or StuG III Ausf. G will result in untimely and useless death, while playing the front line support tank can, if done properly, result in excellent games. The vehicle itself is large and unarmored, making it an easy target to hit and penetrate. Its size also lends to its poor camo, making sniping difficult. To remain unspotted, it is generally a good idea to keep about 400 meters between yourself and the enemy. At this range, your accuracy is just enough to hit the target most of the time. Your penetration is also still high enough that it often doesn't matter where your shell hits as it will still usually go through on most tanks. By keeping this distance, you won't have to worry about exposing your large profile or being flanked. However, you are more likely to land shots closer up, so it ends up being a classical case of risk versus reward in regards to how you chose to play it. In a tier VIII battle, just try to stay hidden, and get the occasional shot off. A 440 damage shot from a tier VI to a tier VIII will be worth many credits and xp points. This page was last modified on 27 March 2015, at 14:00.